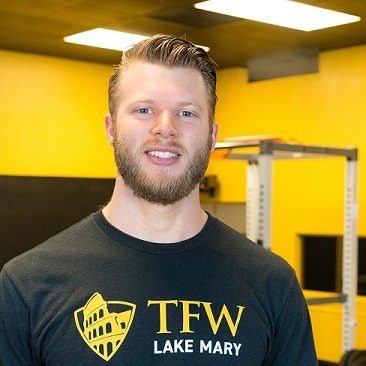 Jesse Walker, owner of the Training For Warriors Lake Mary franchise, prides himself on operating a business that is much more than a fitness center. "What sets us a part is the level of culture of being a family here is no longer just the coach initiating connections, but the culture is being built by the members themselves- what we call familia," he said. "We believe culture is the cornerstone of accountability. When people become a part of something, it becomes easier to behave in healthy way. Our mission is to help people bring out the warrior within. That’s lifestyle changes from the inside. We are a fitness program but our motivation and accountability mean people see effects when they are not here." Training For Warriors' Lake Mary focuses on effectiveness and safety. "The actual science in the workout programming also sets us apart," Walker explained. "Every workout we do is highly evaluated for its effectiveness. No one should get injured or sick in pursuit of health. Too many workout programs are OK with that and they are developing a bad name for themselves as a result. Everything we do is closely monitored. Everything from the get go is designed to be very safe." Walker's advice for aspiring entrepreneurs is focus, learn and plan. "What helped me the most was the minimum viable product concept," he said. "You want things to be as good as you can starting off but at same time you have to evaluate because there's so much to do to launch and grow and you have to prioritize your time and think about what the most basic core thing is you're offering and not allow other ideas to lead you to distraction. Secondly, if you're not learning from others, you have to ask questions and pick the brains of people who have done it before because there's no reason you should make mistakes that they have already made. Lastly, overplan before you decide and take your time to make decisions."